Ascarids are large roundworm reaching over 10 inches in length, whitish in colour which live in the small intestine of the animals. It mainly affects foals (less than two years). The young donkeys are infested by swallowing the Ascarids' eggs which are everywhere in the environment: pasture, litters... They hatch after ingestion and their migration route includes the liver and lung, then reach the air cells through the blood. Then the larvae will go up to the bronchial tubes until they reach the throat, and then will be swallowed with the expectorations and return to the intestine where they are transformed into adults parasites. The female adult Ascarid lays thousands of eggs each day which are rejected into the faeces. The larvae are encapsulated within eggs on the pasture and can survive uptill for years. The complete cycle of life lasts for 10 to 16 weeks. Generally, the foal is weakened and he can lose weight, and that results in a delay in the growth and a dull fur and stitched, apathy, anorexia as well as tendinous and bone disorders. It is not rare to find Ascarid's adults in foals which are 2,5 months to 3 months of age because they could eat maternal droppings and can be contaminated after the first days of their life. For the young foals, the worming should be given at 10/12 weeks of age, and repeated 7 weekly until 1 year old. For the adults, the diagram of worming has interventions in spring, summer, autumn and winter by using anthelminthic against the strongyles, bots, ascarid and taenia. To try to avoid a fast contamination of the foal, you should look after the females in gestation. It is thus advised to treat them just after the foaling, and to remove the faeces every day in the stables. 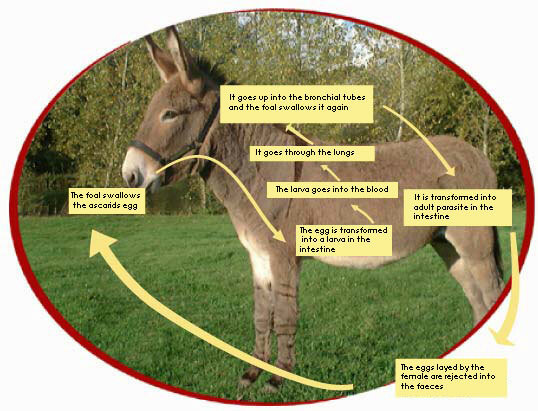 It's important to give the worming to all donkeys in the same group at the same time, and to any donkey who has been introduced into the group.